Abu Dhabi, United Arab Emirates; October 23, 2018: Masdar City, Abu Dhabi's flagship sustainable urban development, has embarked on the next phase of its sustainable mobility network with today's formal unveiling of its first NAVYA autonomous vehicle. Capable of transporting up to 12 people, the ‘Autonom® Shuttle' was inaugurated in the presence of dignitaries representing the Department of Transport, Abu Dhabi Police, and the French Embassy. Also attending were Khaled Al Qubaisi, Chief Executive Officer for Aerospace, Renewables & ICT at Mubadala Investment Company; Mohamed Jameel Al Ramahi, CEO of Masdar (Abu Dhabi Future Energy Company); Mohammed Darwish Al Qamzi, General Manager of Integrated Transport Center, Department of Transport in Abu Dhabi and Jérôme Rigaud, Deputy CEO of NAVYA Group. Designed by the French autonomous vehicle pioneer NAVYA, the Autonom® Shuttle is a self-driving electric vehicle dedicated to first and last-mile transportation. It carries up to 12 people with 8 seated, is fully autonomous and has a top operational speed of 25 kilometres per hour. Having successfully completed a rigorous pilot phase, the NAVYA shuttle will shortly begin a regular all-day service linking Masdar City's parking areas with its main podium. The service will be the first operational use of the technology in the Middle East and North Africa. 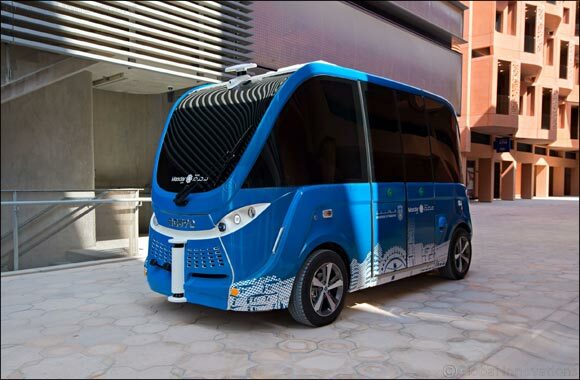 Working closely with Abu Dhabi Department of Transport and NAVYA Group, the NAVYA shuttle was customised to mitigate the effects of the Gulf's extreme heat and humidity on battery performance. Rigorous health and safety testing was also carried out to safeguard passengers and pedestrians. The vehicle uses on-board cameras and sensitive LIDAR sensors creating 3D and 2D “perception maps” to detect obstacles and their position relative to the vehicle. GPS technology further allows the vehicle to define its precise location, as well as V2X to communicate with traffic lights. At Abu Dhabi Sustainability Week 2018 in January, NAVYA was selected as the winner of a global industry competition to supply Masdar City with the latest models of autonomous electric vehicles. Implementation of Masdar City's wider transportation strategy will see the arrival of a fleet of seven Autonom® Shuttles from next year. Over time the shuttle route map will be expanded to connect the Etihad Eco Residence complex above the city's North Car Park with the headquarters of the International Renewable Energy Agency (IRENA) and Majid Al Futtaim's My City Centre Masdar shopping mall due for completion in the first half of 2019. Previous Story : Ford's Self-Driving Business Development Expands to Washington, D.C.